Radiofrequency devices produce an electric current using electromagnetic radiation falling within the frequency range of 3 to 300GHz. When this current pass through a tissue layer, it produces heat. Skin rejuvenation occurs as a result of the thermal or heat damage to the dermis, the skin layer beneath the epidermis. 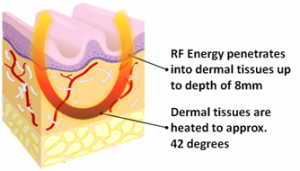 Because it impedes the passing current more than most other tissue in the skin, the subcutaneous fat layer below the dermis generates greater amounts of heat and paves the way for deeper thermal effects. Radio frequency is not a new technology. It’s been used for medical applications involving tissue heating for more than a century. Since gaining US FDA approval in 2002, it has been widely used as a non-ablative skin rejuvenation method. Although different devices produce varying results, with most current Radiofrequency technologies, it is possible to see at least some improvement in the skin tightness in the majority of people undergoing treatment. The advantage of radiofrequency is that it is “color-blind” so that it doesn’t matter if you are tan or have a dark color of skin, it doesn’t specifically heat up melanin, thus removing a big potential cause of side effects from laser (too much heating of the skin, which can be different for different people and even different parts of an individual’s face or body can cause hyperpigmentation or darkening of the skin.